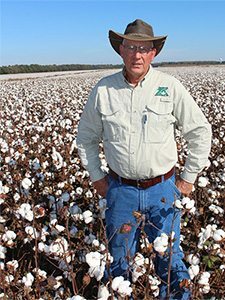 In the pre-eradication and pre-Bt cotton days, growers would hand off their spray program to consultants and expect them to perform miracles with insecticides that slowly lost their efficacy and rapidly flared other pests. It was intense work, but only for a few months and was made easier by cell phones, large contiguous fields, and a focus on cotton entomology. Some gluttons for punishment would even hop over the big pond to repeat the process in Australia ─ getting two seasons of consulting in one year. However, today cotton growers use crop consultants to enhance multiple decisions on the farm. The independent expertise and advice of a crop consultant who is knowledgeable about crop production and particularly your farm can help avoid costly inputs or errors. This month’s Spotlight focuses on two consultants, Billy McLawhorn and Stan Winslow. These gentlemen epitomize the modern, year-round consultant who brings added value to their growers by diversifying their own operations. 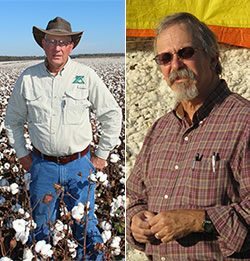 Both are recipients of the Cotton Consultant of the Year award and former Presidents of the National Alliance of Independent Crop Consultants (NAICC), so both are highly successful and both are highly respected by their peers. Cotton Consulting Innovation – Research the next generation of crop production products. Crop Protection has challenges: (1) sorting out which combination of pest control tools to apply. These tools include: Varieties (biotech traits and Host Plant Resistance), Pesticides (modes of action, combinations, sequences), and Agronomy (crop rotation, tillage, planting date, fertilization); (2) delaying or dealing-with pest resistance to these various tools; and (3) the changing status of efficacious tools (new products get introduced, some are delayed, older products are removed, resistance develops and spreads). 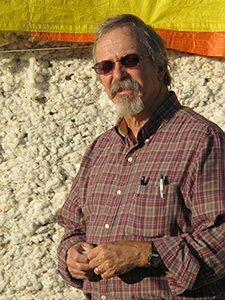 Stan Winslow elected to expand into contract research on the next generation of crop protection products, which indirectly benefits their consulting business by addressing these three challenges. Testing of non-approved products requires tight controls over every step from shipping, storage, crop production, then destruction, data collection, and long term record keeping. It helped that son Matt had worked for a major Crop Protection company. Although the knowledge they gain from contract research rarely gets published, it does get applied to large acreage via their early knowledge of what works and what doesn’t. Stan and Matt get to evaluate new technologies several years before growers get their hands on them. Although growers rarely have time to engage in this intensity of testing, they can and should scrutinize newly approved products. The “relatively easy” days of crop protection are gone, when products such as pyrethroids and glyphosate worked on a broad spectrum of pests and crops. A consultant can help focus a grower’s decisions on the best available alternatives. Billy McLawhorn consults on some 35,000 acres, most of which is dryland. He consults on tobacco, sweet potatoes, wheat, corn, and peanuts, but cotton and soybeans constitute most of the acreage. Billy relies on extension specialists, other consultants, his and his grower’s experience, and his excellent five other team members in providing timely information to his producers. In addition to the Pre-Season plan, in-season scouting and tissue analysis with recommendations are provided to the grower on a timely basis. Billy also provides the growers with a year-end report of what went on that year and how some operations can be improved. Some of Billy’s growers want only the Pre-Season book, but all want him to help on their farm as a highly experienced “second pair of eyes” ─ a resource for the latest cotton production technology. Stan, Matt, and Billy set a high bar for consulting expertise and grower service, but across the Cotton Belt consultants like them are routinely helping growers enhance profits and use purchased inputs more efficiently.